now a property of the Trustees of Reservations. She is a seed lover and co-founding member of The Martha's Vineyard Community Seed Library, formed in 2014, and currently a joint project of Island Grown Schools, The Polly Hill Arboretum, The West Tisbury Library and The Farm Institute. The Seed Library's mission is to celebrate seed diversity, reclaim the ancient practice of seed saving, create a unique collection of seeds that are well-adapted to our island's environment, and increase the resiliency of our island's food system. Rebecca grew up on a small farm in rural N.H. and first arrived on the island in 1990. She spent several summers working at both Hillside Farm and the Solviva Greenhouse before enrolling in the University of Massachusetts, Amherst, where she obtained a bachelor's degree in Plant and Soil Sciences. After spending 7 years teaching math and science to Special Ed. students in western Mass., she decided that the garden truly was the best classroom of all, and returned to the Vineyard to steward the Farm Institute's "Friendship Garden". Since 2012 she has been tending the herbs, flowers, berries and vegetables that grow here and sharing her passion for the natural world with children of all ages. Katie Ruppel grew up in Fort Worth, Texas with two parents who loved to garden together. As a child she saw that the garden was an important place for her parents to work quietly and happily as partners. It wasn't until after college that Katie found her own love for gardening. She received a degree in journalism from Texas Christian University, and while working for a local newspaper she interviewed a young gal about her work in the city's community gardens. Katie started volunteering, and built her own garden, too (making many mistakes!). Through seasons of mistakes, mentors, experiments, and good books, her knowledge continues to grow. In 2014 she attended the Seed Saving School through Native Seeds/SEARCH where she shifted her attention from growing food to growing seeds. She is a member of the Martha's Vineyard Community Seed Library and is saving cucumbers for the first time this year. She currently works for Island Grown Schools as a garden educator for the West Tisbury and Chilmark schools, where she is able to connect children to the seeds, soil, plants, and farmers that feed us. NOTE: The Google map below is deceiving. The Old Mill is located directly across the street from the Mill Pond. The Mill Pond (to the left of the red marker ) is actually larger than it appears on this map. Note: The Old Mill is less than 1/10th of a mile from Alley's General Store. Pass Alley's General Store on your left. Drive 200 feet, and turn right onto the Edgartown Road (toward the Airport and Edgartown). The second driveway on your right leads to the Old Mill's parking area. Head west on the Edgartown Rd toward West Tisbury Center. Drive 3.8 miles. The Old Mill will be on your left, directly across from Mill Pond. The driveway is immediately beyond the building. Pass Up Island Cronig's (469 State Road) on your right. Turn left onto Edgartown Road (toward the Airport and Edgartown). The second driveway on your right leads to the Old Mill's parking area. 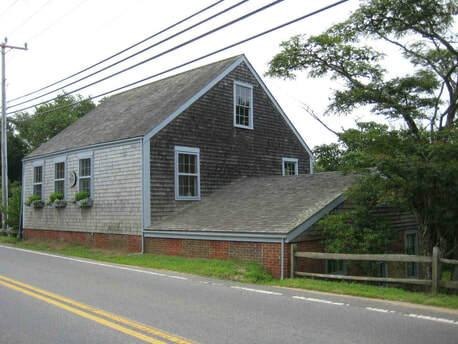 IMPORTANT: From July through September, all meetings are held at the Old Mil on the Edgartown Road in West Tisbury. Parking is limited. Please carpool. Check HERE to see who else will be speaking in 2017. ​messages sent via email to members.